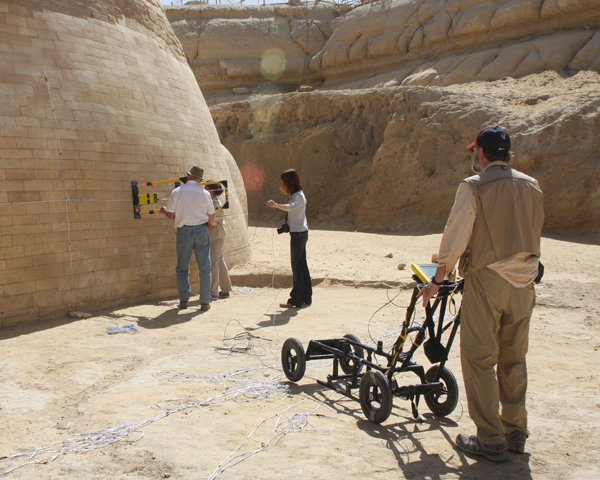 Radar Survey of the Sphinx in progress: Mark Lehner and Ana Tavares position the ground penetrating radar’s antennas where Joan Dash indicates while Glen Dash monitors the controls. In this set of tests, the radar's antennas were moved horizontally in one half meter increments in order to produce a raster scan of the interior of the Sphinx. The gray tape served as a guide. The work was performed under the auspices of the Supreme Council of Antiquities, Dr. Z. Hawass, Secretary General.